VietNamNet Bridge – Cao Van Ba, who has lived on the Son Islet in the middle of the Hau (Rear) River for nearly 50 years, fears that he will have no choice to move to the mainland as erosion is destroying his farmland. “My family has 2 ha of farmland near the head of the island, where half of the land has eroded over the last 10 years,” the 66-year-old farmer said. The islet, located in Can Tho City’s Binh Thuy District, covered 100 ha but is now only 60 ha. Other islets in the Cuu Long (Mekong) Delta, where thousands of families live, are also expected to vanish because of serious erosion. Formed by silt deposits from the Hau River, Son Islet has many fruit orchards and household farms. Community tourism is also a source of revenue for families. But, because of eroded farmland, many families have moved to the mainland, and only 78 households remain. Pham Van Nhu, of Binh Tan District in Vinh Long Province, who lived on the islet for 10 years, moved to the mainland after losing 8,000 sq metres of land from 1978 to 2012. The family had to move 10 times. “We sold the remaining land at a low price and then moved to the mainland,” Nhu said. After years of excessive sand extraction on the Hau River, landslides along the riverbank have become more severe, causing deep subsidence. A little further upstream is an islet called Ca Doi, located on the Hau River in Can Tho’s Thot Not District. Erosion has washed most of it away. In 1960, Ca Doi was 4 km long and covered by paddy fields and sugarcane farms. Due to the fertile soil, many people from nearby Tan Loc Islet and Dong Thap Province’s Lap Vo District in the past moved to the islet to cultivate sugarcane and rice. “Every morning, people came to the islet by boat to take care of their gardens and then returned home in the evening. But no more!” said Le Van Huan, chairman of Fatherland Front Committee of Can Tho City’s Thot Not District. By 1990, Ca Doi Islet had only 6 ha, and by 2005, had disappeared completely because of erosion, according to the Thot Not District authority. Another islet, Tan Loc on Hau River, has lost 10 ha out of 3,334 ha over the last six years. Worsening erosion has affected a large area of farmland, according to Le Thanh Nghi, vice chairman of Tan Loc Ward’s People’s Committee. In Dong Thap Province, the Long Phu Thuan and Tay islets have also suffered serious erosion, as have the Dong and Cho Moi islets in An Giang Province. In 2011, 250 houses on Tay Islet collapsed into the Tien River with an affected area stretching 4 km. In the following years, five communes on the islet were seriously affected by erosion, caused by illegal sand exploitation, according to local residents. Among the residents, desperation has turned into anger. Recently, 50 locals living on Tan Loc Islet noticed a group of people who were illegally exploiting and transporting sand on large barges. They used motorbikes to chase them off the sand mining barges operating on the Hau River. The police are investigating the case, according to local media. Dong Thap Province also has more than 2,100 households living in an area at a high risk of erosion. The province has asked the central Government to fund VND900 billion (US$42 million) to resolve the erosion in the province. Meanwhile, thousands of households in An Giang Province live in erosion-prone areas, but have still not been relocated to safer areas. The Ministry of Construction has asked the Prime Minister to develop an additional 132 projects to build concrete dykes and barriers around seriously eroded areas as well as move 44,800 households to safer areas in the Mekong Delta. In recent years, erosion has swept away 500 ha of land each year in the Mekong Delta, according to the Ministry of Agriculture and Rural Development. The Mekong Delta has 265 erosion-prone areas with a total length of 450 kilometres of rivers. About 200 km of coastal areas have lost 30-40 metres of land every year, according to the ministry. By 2050, one million people in the Mekong Delta will be affected by land and coastal erosion. The cause of the erosion is mostly because of the increasing number of dams upstream that have caused the water level to change. This has blocked the flow and amount of sediment and reduced biodiversity in the Mekong Delta, experts have said. 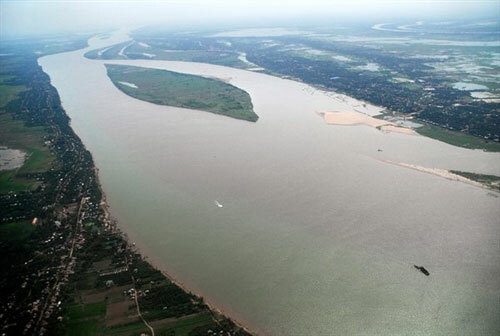 Erosion and sea water intrusion are expected to become more severe in the Mekong Delta. Experts forecast nearly 40 per cent of the region will be 30 metres under water by 2100 because of global warming.